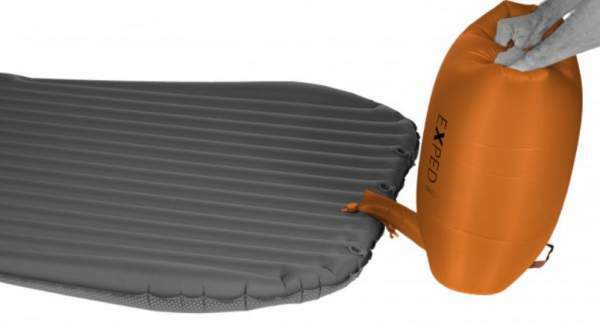 Exped AirMat HL Duo Inflatable Sleeping Pad is incredibly packable and lightweight mat built in two sizes, for warm weather camping, hiking, and backpacking. Exped AirMat HL Duo sleeping pad. Check on Amazon, they usually have the best prices and shipping conditions because of their 15 stores on several continents. As you realize from the name, this is an inflatable air pad built in the sizes M and LW, with baffled chambers that are 2.8 inches (7 cm) thick. This is a duo-pad and they have built the two parts as separate chambers. This is good to have so when one of the users is turning around, he or she will not disturb the partner. Two separate valve systems for the two halves of the duo pad. Note that the pad comes with the Schnozzel Pumpbag which you use to inflate the bag and it also doubles as a waterproof stuff sack. By using this to inflate the pad instead of blowing the air in with your mouth, you avoid potentially destructive moisture accumulation in the pad. This Schnozzel Pumpbag works in sub-zero temperatures and it allows for inflation of the mat in 2 minutes. This is how the Schnozzel Pumpbag works. The fabric is with Exped’s proprietary Honeycomb GripSkin technology and this means a slip-free surface and a quiet night’s sleep. The baffles on the sides are thicker, so this gives it a cradle shape and it should help in preventing you from rolling off the mat, see the picture below. Both the top and the bottom are a 20D polyester with a TPU polyether film laminate, hydrolysis resistant and Oeko-Tex 100 certified. The cradle shape to keep you on the pad during the night. Seasons-wise, with a temperature rating of 39 °F (4 °C), this is a sleeping pad for a warmer environment, say a 2-season sleeping pad. You see this also from its R-value 1.9. For a cold weather camping better choose some of the pads with insulation like this Klymit Insulated Double V Pad or the much warmer ALPS Mountaineering Lightweight Self-Inflating Double Air Pad. Weight-wise, this pad is simply impressive. You will realize this also from the comparison table below. Its M version weighs only 1.54 lb (700 g). Note, this is in the range of solo pads. Size-wise, I myself am not a tall guy and it can work for me, but the M size of this pad is quite short for most users. The length is 72 inches (183 cm). It is also very narrow and a tapered design with only 41.3/32.3 inches (105/82 cm) at the shoulders/feet area. So I see it more like a very wide single pad than a true double pad. But they also have a LW version (see in the specifications below) which is both longer and wider, though also heavier. Yet even this version is in the category of ultra-lightweight pads. The packed size is extraordinary, 7.9 x 4.7 inches (20 x 12 cm) for the model M, and 9.1 x 5.1 inches (23 x 13 cm) for the model LW. All in all, it is so nicely packable and light and this makes it incredibly versatile. With all these features it is good enough even for backpacking. If you are with a partner, having such a duo pad is much more comfortable than using two narrow pads. With this you avoid the gap in between. There are sleeping bags for two people and they even have a sleeve for such a pad, you can see some examples here. So again, even in such a structure, using one double-wide is more comfortable than two single pads. As you know, single sleeping pads are usually narrow. So whenever I go for car camping, I use one of my double-wide pads. Most of the time I sleep in the car, so an air-pad is good enough and I do not need insulation. The same is if you are on a paddling or cycling tour. Such air pads are incredibly compact when packed, and this Exped AirMat HL Duo is an excellent example. But let’s be fair here and stress that two solo pads can still be lighter, take this Klymit V Ultralite SL Sleeping Pad as an example, it weighs only 337 grams. For M model – not so great size. The M version is too narrow for two people, it is better suited for a mother with a child. Luckily, they have the LW version as well, so this should be fine for most of the users. This is an expensive but high-quality pad, currently, the M version costs $232 on Amazon. You will be able to compare this with some other double pads on the market, there is a comparison table below. Here is my rating for the model LW. Note that I use the same criteria for all the pads here in the site, so you can easily compare. My rating for the current price is low but the price may change when you read this text and if so simply ignore my price rating. – M: 1.54 lb (700 g). – LW: 2.19 lb (995 g). Pump weight: 2.1 oz (60 g). – M: 0.60 oz (16 g). – LW: 0.63 (18 g). Temperature rating: 39 °F (4 °C). – M: 72 x 41.3/32.3 x 2.8 in (183 x 105/82 x 7 cm). – LW: 77.6 x 51.2/40.6 x 2.8 in (197 x 130/103 x 7 cm). – M: 7.9 x 4.7 in (20 x 12 cm). – LW: 9.1 x 5.1 in (23 x 13 cm). I believe in the importance of comparison as the best way to understand features of an item like this pad, and this in particular if you are new in this activity and not well informed about the pads’ industry. So here I give two sleeping pads both double size and both inflatable, uninsulated pads. As you see, the Kelty’s pad, although the same type, is more than 3 times heavier, though this is because it is wider and thicker. You certainly would not carry it on the trail. The Klymit pad is also ultralight, but see its size. So from this comparison, you realize how extraordinary the weight of this Exped’s pad is. Note that I use the LW version here, yet it is still lightweight enough to be used even as a single pad on shorter hiking tours. It is certainly worth the effort in view of its comfort. But this Exped AirMat HL is rather expensive, please follow the links in the table to realize this. In the summary of this Exped AirMat HL Duo Inflatable Sleeping Pad review, I would stress that they have managed to make a really exceptional piece. This pad is perfect for couples who need comfort but with a small package, and it is light enough to be used even as a solo pad, in particular its M version. But if it is above your budget, check the models given in the table above, and also visit my page with pads. If you need an insulated pad, you might want to check this Exped SynMat Deluxe 7 sleeping pad and also their Exped SynMat 9 with a built-in pump. Please check also this Therm-a-Rest NeoAir Camper Duo Sleeping Pad with its dual chamber design and a bit of insulation. Note that I am not paid by the brand or related in any sense, so this is NOT a sponsored text. I only give my unbiased view of the product. Thank you for reading. Please use the comment box below in the case of questions and comments. Have a nice day.